Nicaragua is one of the poorest countries in the Western Hemisphere. The country is striving to overcome the devastating effects of dictatorship, civil war and natural disasters. Extreme poverty in Nicaragua continues to be concentrated in rural areas, where more than 25% of the population struggles to survive on less than $1 per-day. This harsh reality makes obtaining an education and acquiring professional skills nearly impossible for the average Nicaraguan youth. .
Only 9% of children in Nicaraguan rural areas who start first grade will finish primary school. Many children in rural areas are unable to attend school due to lack of educational institutions, and the existing schools are of low quality. Many families are unable to afford the cost of tuition and books for their children to attend the mandatory six years of schooling. As a result, most students take an average of 10.3 years to complete school. 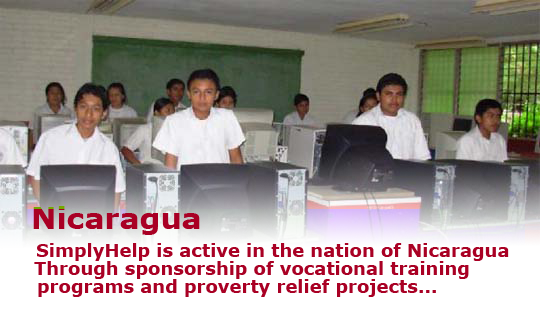 With the support of SimplyHelp, Nicaraguan children and adults have learned how to use computers and continue their education, enabling them to find better jobs and improve their living conditions. Guillermo Ampie Lanzas High School in the city of La Concepcion has a student body of 1,500 students and teaches its students for free. SimplyHelp joined the school in its educational efforts by providing computers and printers for computer classes, sewing machines and fabric for sewing classes, and materials for carpentry classes. Most students at the school come from low income families and have parents who are unemployed, merchants, or farmers. Students who earn a diploma from this high school leave with strong trade skills, and can find a job within weeks after graduation. Most of the sewing students go on to work at Zonas Francas, an area with international factories and great job opportunities. About 40 % of the students go on to study at the university level. Average ages of the students are 11 and 17-years-old. About 57% are female and 43% are male. Students in the tailoring and carpentry classes are also able to find steady jobs within weeks of graduating. Because of SimplyHelp’s support for the computer, tailoring and carpentry classes at the school, students who did not have the means to pay for an education are now able to graduate and obtain steady, reliable jobs.